It doesn’t always look it on the surface, but things change a lot around here. It is in fact very much the spirit of the place. Progress and all that. The fact that to the untrained eye it doesn’t look as such is most likely because the fundamentals never change. They’re set in stone. Principles — that’s what they are. The best make in the British Isles. Best materials, too. And the best possible interpretation of every sartorial staple: enough to keep busy the average wardrobe for a month or so. And, since they’re so firmly set, these fundamentals, you’ve got your safety net. You can dream all day about changing things, big or small, entirely without fear of veering off in the wrong direction. The flip-side of this luxury is that, when things don’t change, it’s not through laziness of oversight. No — it’s almost certainly because there’s currently an absence of a better idea, which means the extant idea is probably, at worst, an alright one. Such is the case with the trench coat. 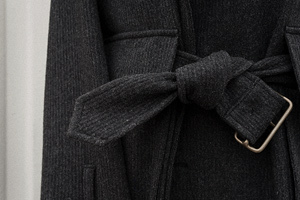 It was developed in 2013 with the sounds-easy premise of a very traditional trench — double-breasted, one-piece raglan sleeve, belted, knee-length at least, storm-guard and yoke — with all that is extraneous or these days nonsensical — fussy little tabs and loops, fiddly hooks and eyes — stripped or redesigned. Three years and about eight cloths later, and no change. No change that is, ’til today. The change is found in the belt. Gentlemen, see, it transpires, come in all shapes and sizes. One man blessed with the most standard of builds — a “classic 38”, say — can have a localised circumference (a belly) which is wildly and widely different from another man with otherwise the same claim. 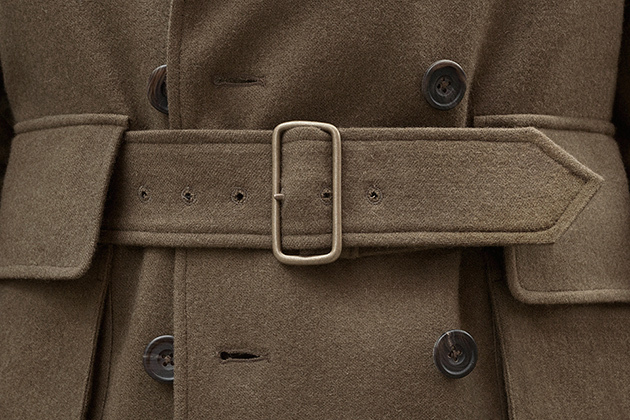 This means is that, while when worn by the first man, that trench coat belt will be just the right length; on the other, you’re left with a short, girdle-like stub, or perhaps worse, a long and limp and frankly silly-looking half-metre sash. The change is here. A small change, no doubt, but one that makes a staggering amount of sense. It’s a retainer. 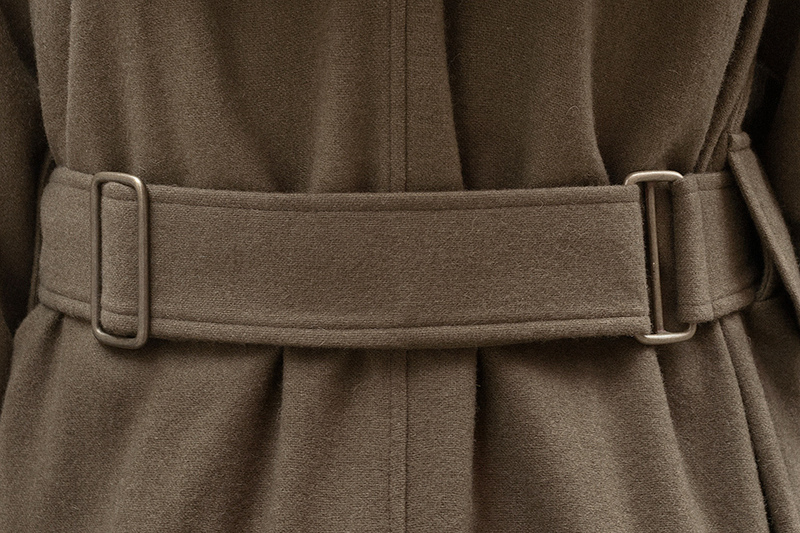 A two-piece belt, in other words, joined with two loops and fastened as usual with one buckle. The result is a belt always at the length you set. And, even if never used, it means two additional articles of sand-cast brass adorning your rump. Everyone a winner. That includes anyone who has come to acquire one of the trench coats we’re talking about here: return the belt to the workshop for a free, no-quibble upgrade.